After defending his love against the societal pressure in the drama, Chen Xiao must fight against it once more for XiaoLongNv’s actress. Using netizens’ mockery of the new adaptation, the first official ad for the newly-named The Romance of the Condor Heroes has Chen Xiao, calling for the audience to shatter the wall of gossip, and look at the series and Michelle Chen for what it (she) really is. 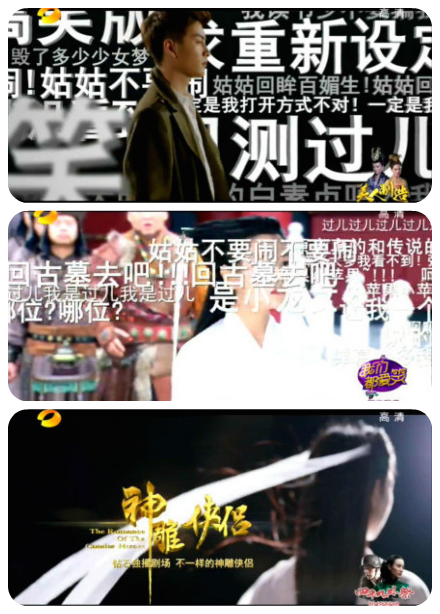 This is exactly why no one planning to air on Hunan TV should release trailers before Hunan TV does. I feel like their ads deserve to be put on altars. For another example, I love how this ad of Ancient Sword turn real-life news hotspots into positive selling points for the shows. The series is set to follow The Song of Desert in its weekly spot. Chen Xiao’s other drama, Cloud Song, has unfortunately been pushed back once more. This entry was posted in Drama, Mainland China and tagged Chen Xiao, Michelle Chen, The Condor Heroes, The Romance of the Condor Heroes by idarklight. Bookmark the permalink. I’m not against Michelle, she’s indifferent to me, I didn’t even know her name before this adaption but I can’t find that XLN’s feel on her, not after LYF. I saw a gif on weibo of her interpretation of XLN and if isn’t for the description I’d seriously think she was Huang Rong instead. And she’d be a perfect HR. As for the ad what’s the point focus the entire ad on CX? I’m not his fan and I’m sure his fans’re going to watch it even without this ad. I like the idea behind it but pretty useless at least on me. Another thing – is it just me or is the main supporting cast surprisingly not-so-gorgeous? Because usually, that’s how Yu Zheng saves his dramas, but this time Chen Xiao and Zhang Xueying are like the only good-looking members of the key cast members. Zhang Xinyu (Li Mochou) cannot act at all, and I feel like whenever a drama with Sun Yaoqi/Zhao Hanyingzi/Wu Jingjing/Mao Xiaotong (people who are in love with Yang Guo) as a lead airs, it’s usually an indicators of someone in the Hunan acquisition department screwing up. I agree about the “not so” gorgeous of the other female casts as compared to YZ’s usual beauties in his other series, but I still think they’re better on the eyes than MC. Even CX looks like a kid and average at best as Yang Guo, when we all know he could be better looking. Cool concept for the ad, but it kind of defeats the purpose for the ad to visually focus on Chen Xiao only. No matter how much he defends her or how much netizens love him, Michelle is the one who’s going to have to prove herself through her acting (if not her looks). I have a feeling she’ll be even more criticized than the first time (when netizens found out she was casted). They (netizens) already had a head start watching the trailers. The trailer was painful to watch. I actually think Chen Xiao is just as bad as Michelle in their roles. And his acting isn’t better than hers. Aside from not finding him attractive (he looks like a boy, not a man and the hair/clothing does not help), his acting has always left me thinking his character could have been better if someone else was playing that role. Yu Zheng is a strange one. He will blatantly plagiarize another story/drama, but when he actually owns the production rights, he goes and butchers it. Changing or adding parts to the story to give a fresh adaptation to audiences is a great idea. But changing it so that the characters behave and think in a way that is contrary to how they were written doesn’t make sense. I was actually guilty of not giving Michelle Chen a chance as XLN. I tried to brush away the fact that she does not give me that ethereal beauty. I thought, I’d give her a chance, maybe she will be better in action (acting). I saw the trailer and she didn’t prove me wrong. She is still so wrong for the part. I can only imagine Liu Yifei as XLN, so I tend to think of all other XLN as not like her enough. In general, I think the correct way to watch Yu Zheng dramas is to drop all priors and pretend it’s a new drama. That was how I managed to enjoy Swordsman, which is actually pretty fun minus the complete butchering. Although to be fair, Jin Yong did make XLN less ethereal and more down-to-earth and flirty in his latest revision that I would like to pretend never happened. Hahhahaha…I did erase what I know of the character. One thing I can’t detach myself is that the most beautiful character in the series is less attractive than the rest of the female cast…. One other thing. Maybe I’m speaking too soon, but Michelle’s acting isn’t all that great. She and Chen Xiao have no chemistry (per the trailer). But Chen Xiao is the prettiest of them all! I’m kind of excited for the weird concept of Zhao Liying being Chen Xiao’s mother. If Tangren and Yu Zheng didn’t hate each other so much, it would’ve been fun to see Liu Shishi guest starring as Mu Nianci.